YouTube has a mobile version of its video sharing service, but it doesn't let you watch any video you want. Only the most popular or highly rated videos can be accessed from your mobile phone. To remedy this serious omission, you can use Mofonow, which lets you convert YouTube videos to a format suited to viewing on your phone. Just supply the URL of the video. You can also upload your own videos to convert. 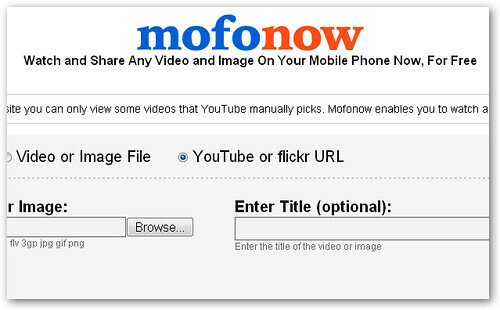 Supported file types include AVI, MOV, WMV, FLV, and 3GP. Flickr image conversion is also available. The only downside is that you have to convert YouTube videos from your computer before you can view them on your phone. But if the video is a long one, you can just submit it for conversion to Mofonow and watch it later at work or wherever you are outside. Although if you don't care about watching any video in particular, you can always visit Mofoyo for an extensive archive of videos that have already been converted by other users. Mofoyo stores all the converted videos so there are already thousands of videos that you can watch.